There was going to be an update about how Kaelyn seems to be getting choked up on her own secretions or food. However she was admitted to the hospital before that post was finished. On the 27th November afternoon, grandma found Kaelyn breathing rapidly. She was promptly sent to the PD nearby for a quick check. At first they were insistent that Kaelyn had to queue up to see the doctor. But after assessing her condition, I am glad they were able to make concessions for her, allowing her to jump queue to have a quick look. Mummy skipped her massage session. I rushed back to have a look. By then, she was back from the clinic and was slightly better. But we admitted her to the KK hospital Children Emergency (CE). She got checked in the emergency ward, got her x-rays done, IV plugged in and was fed oxygen through an enclosed box around her head. 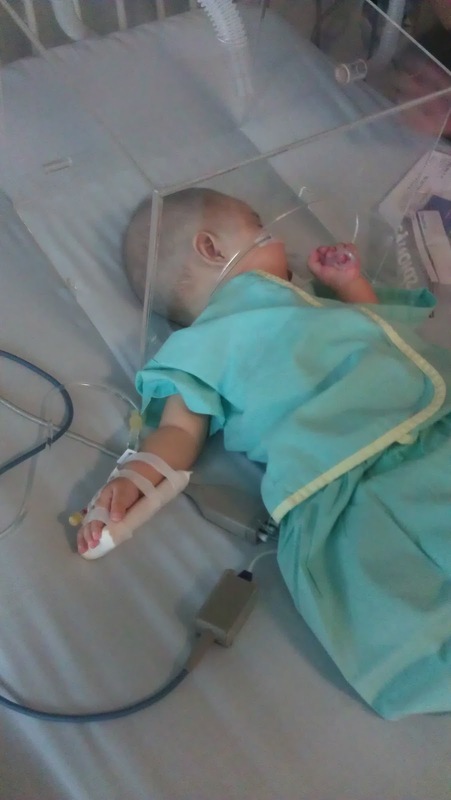 Her right lungs had collapsed due to accumulation of liquid, which could due to a variety of reasons such as her own secretion, mucus, food or even slight aspiration from her milk. She was crying badly, needing to be comforted. She is lying there and you can touch her and feel her. Yet she seem separated miles away by the tubes on and in her and the oxygen hood/box around her head. She seem so fragile at that moment and we were afraid that if we attempt to carry her, it will cause her condition to deteriorate. She was warded into the high dependency ward. Her oxygen box was removed as her breathing was compromised and a bipap machine (Bi Level Positive Pressure) was used together with a nasal prong to push air into her airways and lungs to keep it open. The nasal prong was changed to a more comfortable maskmedic mask. Her routine of twice a day or thrice a day chest physio and suctioning of her nose and throat also began. Chest physio is using percussion on her chest area to loosen any secretion in her lungs. After knocking those secretion loose, suctioning is done to clear it up. 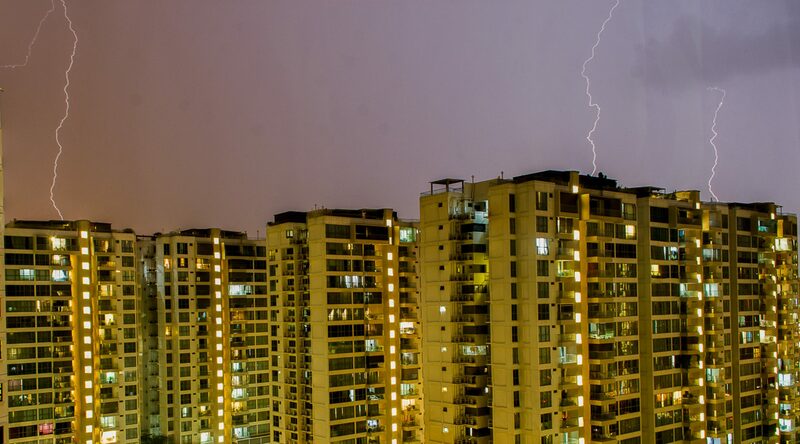 Additional suctioning will be done as needed during the day or night. This is one routine she hates. I can imagine why as I received something similar for a test of virus years ago. Imagine stuffing that suction catheter deep through your nasal airway. This routine went on for almost a week and she was well enough to wean off the mask. We thought we could bring Kaelyn out of the hospital into a couple of days. We were wrong. All in all, she spent a total of 21 days in HD and 11 days in the ICU. 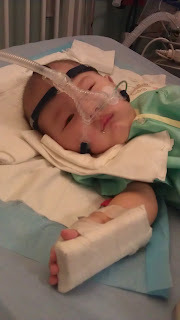 Hours after taking off her mask, she had high fever which she didn’t have before in the hospital stay. Her Oxygen saturation (O2 Sats) level dropped, or desat. Usual level would be at 95% and above. She desatted quite badly a few times. 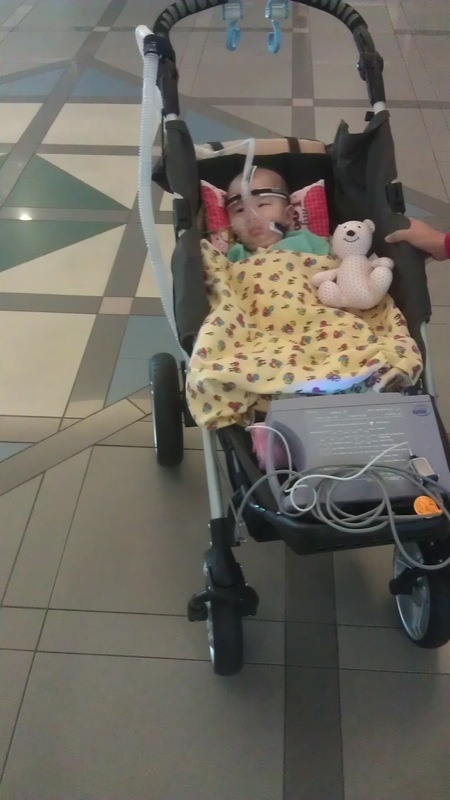 Her Bipap settings/pressure were set higher and higher to better support her breathing. The high dependency ward support for her was at the limit. We were then warded into ICU as she could need to be intubated. 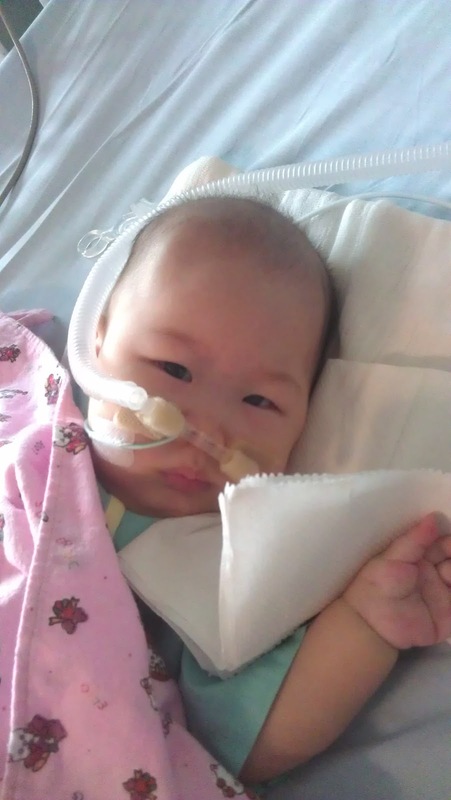 She was also tested positive for Respiratory syncytial virus (RSV). One of common viruses around. But for Kaelyn, it is very dangerous as the symptoms compromises her already weaken respiratory system . It was a result of cross infection in the ward. One of the biggest dangers of staying in hospital. 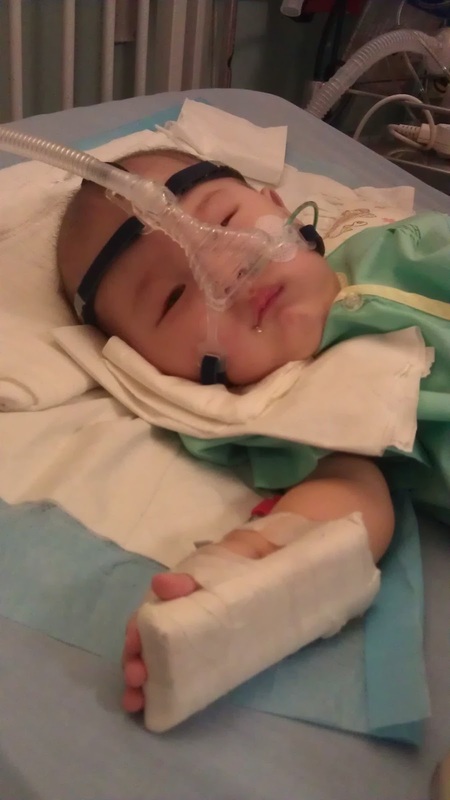 In the first few days in ICU, she continue to desat badly a few times. We couldn’t and didn’t know how to or whether to make the decision such as to call for intubation or not. In those times, we truly thank God for healing, and also thanks to care, guidance and prayers from family, friends and our support group. After 1 particularly bad episode of desat, Kaelyn pulled through and continued to heal slowly. After about 10 days (we lost count of the days) in ICU, Kaelyn was brought back to the HD ward to be monitored further. There was somethings that could be done about the virus itself in terms of medication of anti RSV virus. However nothing can be done for her collapsed lungs except for Kaelyn herself and her body. We could only try to keep it clear through chest physio and suctioning. Let me say that Kaelyn is also probably a very fair person. The last time we admitted her into KKH, we spent mummy’s birthday in hospital. This time round, she made us spend daddy’s birthday in hospital before we got out. In the last few days of admission, we were getting busy with getting the house ready and getting her equipments needed to monitor and assist her. The home care team from KKH assisted us in getting her ready for home and mobility. Her underlying condition (SMA Type I) together with the episode of the virus infection probably also caused her baseline (in terms of health and strength) to drop. And this was Kaelyn’s involuntary 1st admission. Hopefully the only one in long time to come, although it will be difficult.